The second installment of the One-derful! 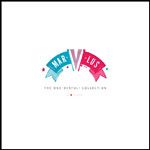 Collection focuses on Mar-V-Lus, the teen-oriented imprint of this legendary R&B label group. Mar-V-Lus is preceded by the One-derful! Records compilation and will be followed by releases of the M-Pac!, Halo, Midas, and Toddlin' Town sub-labels. This series marks the first in-depth study of what was once one of Chicago's most prominent African-American run labels.